Summary: A young Sudanese immigrant wraps herself in the imaginary blanket of her old culture when her new country seems strange, frightening, and lonely. However, when another little girl asks her to play and then begins to teach her English, the newcomer begins to weave a new blanket from the words and experiences of her new home. Literary elements at work in the story: The plot of My Two Blankets gently unfurls through the first-person narration of the unnamed girl from Sudan. The reader learns of her emotions through Kobald’s poignant metaphorical descriptions: hearing the unrecognizable language all around her was “like standing under a waterfall of strange sounds … cold … alone.” To protect herself she “wrapped [herself] in a blanket of [her] own words and sounds.” Blackwood’s illustrations add even more detail to these descriptions, showing the unfamiliar words as sharp objects falling on the little girl and her auntie. As another little girl befriends the Sudanese immigrant, the old blanket’s colors of warm oranges and reds slowly incorporate new words and experiences in shades of blues and grays to match the palette of the new land. How does the perspective on gender/race/culture/economics/ability make a difference to the story? This story shows the reader the experience of the “other” through the lens of one young female immigrant. She is called “Cartwheel” in her homeland – free and joyous and happily a part of her culture. Then the war came, and she becomes a frightened outsider in a land where nothing makes sense. Only one other family member – her auntie – appears in the book. This book demonstrates how difference can isolate or can enrich a community. The last page of the book parallels the first; the little Sudanese girl is turning cartwheels again, only this time she is teaching her new friend how to do it, too. Theological Conversation Partners: My Two Blankets would be a wonderful illustration for the biblical command to welcome the stranger (Leviticus 19:34), whether that stranger is from the other side of the globe or merely the other side of town. Most children know what it is like to be the new kid in the classroom, and this book offers talking points for both sides of the equation: the newcomer and the established culture. More broadly the story speaks to the question of assimilation. The Old Testament is full of mandates warning the Jews against intermarriage (Deuteronomy 7:3), because of the fear that assimilation would lead the Israelites to the altars of false gods. Jesus’ message that God’s love is for all people, then, sounds like blasphemy to some of his listeners (Luke 4:28-29). We sometimes want to wrap ourselves in the comforting blanket of our home culture, like the young Sudanese girl in this story, because it makes us feel safe. However, when the immigrant girl begins to make a new blanket with the words and experiences of her new life, there are echoes of Peter’s odd dream in Acts 10, when a sheet full of non-kosher animals appears before him, and the direction comes, “kill and eat.” (vs. 13) Peter eventually realizes that God has done a new thing, and, like the little girl in the story, that he is welcome to be a part of it. The little girl does not lose who she is in the process of assimilation; she adds richer dimensions to her life. Whether we are struggling with a move to a new town or to a new way of doing and being the church, this little protagonist would be a worthy role model. Also, it never hurts to have (or be) a translator who helps teach the new language. The little girl wearing orange and red in this story has moved from another country. She cannot understand the language of her new homeland. What do you think it would be like if you could not understand anything people were saying to you? How do the pictures show that she can’t understand the language? Why do you think that the orange and red blanket made of the little girl’s “own words and sounds” made her feel so good? The newcomer meets another little girl in the park. How does that girl help the newcomer? If you moved to a new school, you’d probably understand the words people were saying. Name some things you might not understand, though. The newcomer begins to make a new blanket of the new words that she is learning. How does that blanket make her feel? Do you think that the new little girl will have to choose either the old blanket or the new one, or will she be able to use both? 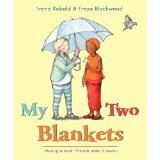 My Two Blankets by Storypath is licensed under a Creative Commons Attribution-NonCommercial 4.0 International License.